I have blamed my recent sleeping problems on work (the heavily intense post-production of my short film THE WHITE FLOWER), I've even constantly tweeted (+facebook status update) about it. But moments ago, a guzheng-playing Twitter friend Seren Koo replied to me by suggesting that writing down my ideas and what I want to do would liberate thoughts from my mind, and thus making it easier to sleep. I realized that my lack of sleep seems to correlate with my lack of blog updates. Many times, writing a blog post at night for me can be quite (mentally) exhausting (despite said post being deceptively mindless! ), and I can just drift off to sleep after that. Thus I will start writing something long, and insightful and mentally taxing just so I can exhaust myself enough to sleep. Alas, the blog post you're reading now is probably not one of them. 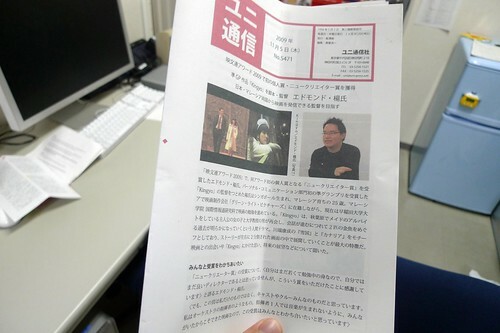 On the 5th of November, an article of me on the Japanese newsletter called Uni Press came out. Uni Press has something to do with Japan's Eibunren Awards, which recently bestowed upon me two awards for my short film KINGYO, one being the Semi-Grand Prix, the other an individual award called the New Creator award. If you know Japanese, you can click each picture to get a larger version and read the text. But for the others, now, in order to exhaust myself even further. 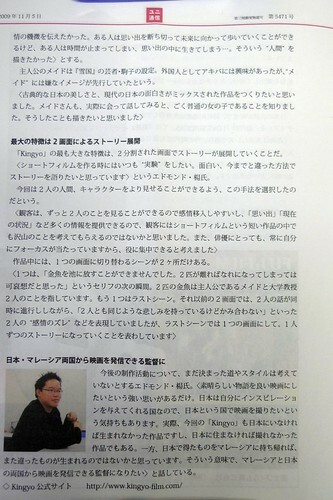 I'll try to give a brief translation of the article. 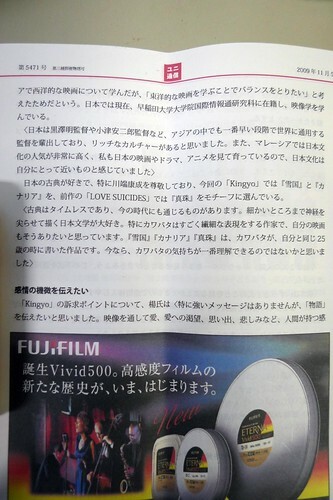 First page of the article introduces me briefly, as a filmmaker who is working at the Malaysian production company GREENLIGHT PICTURES, and am also doing my Masters in Film in Waseda University. And then there's a synopsis of KINGYO, which is about a university professor taking a 'maid tour' in Akihabara, Tokyo during one winter night, and how his conversations with the tour guide dressed in maid costume gradually reveal memories of their past, and a love triangle that continues to haunt them etc. Film's inspired by the works of Yasunari Kawabata, with the plot of his short story 'Canaries' combined with certain elements of 'Snow Country'. Film is noted for its use of split screens in almost the entire length of its running time. Asked how I felt about winning the 'New Creator' award, I said I was flattered but of course this all happened thanks to the cast and crew in KINGYO. As a director I believe I'm something like a conductor in an orchestra, without the rest of the team members, there won't be any music going on anyway. In page 2, more of my background: How my dad being a film critic influenced me as a child, and how, until this very day, if I were Malaysia, I would catch at least a film a week with dad. Asked when I wanted to be a director and I said I wanted to be one since I was 5-6, there were vague memories of watching a scary film (actually it was 'TREMORS', starring Kevin Bacon), when mom, in order to prevent me from freaking out, started deconstructing for me what I saw on the screen, telling me how these were all machinations and illusions conjured by the movie director. Assuming that movie directors were badasses, becoming one became a lifelong dream. After doing my degree (majored in marketing, minored in English literature) in Murdoch University, Perth, I stayed around for another year to do a Graduate Diploma course in filmmaking. Mom gave me my first camcorder just before I went to Australia so I could film anything I thought was nice. I decided to teach myself how to edit, and got friends to make 'home videos' for me (some of them are still lying around on the Internet, and in fact, links are provided in some sections of this blog, but I won't reveal where, hah). Went back to Malaysia in 2006, joined Greenlight Pictures in 2007. Started out as producer before switching back to directing in 2008 with CHICKEN RICE MYSTERY, which won two awards at BMW Shorties 2008 and also got selected for competition in the Dubai Film Festival 2008. 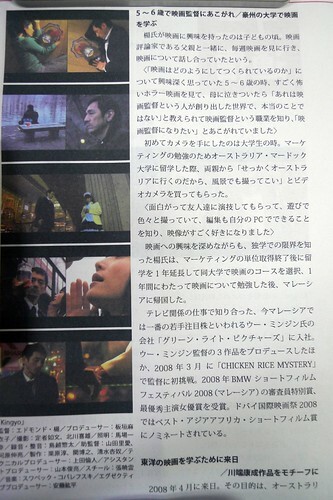 Shortly after shooting CHICKEN RICE MYSTERY I moved to Tokyo, and my subsequent films would be loose adaptations, or interpretations, of Yasunari Kawabata works. Nothing much in this page, just me explaining my love for Japanese literature from the early 20th century, and also how I grew up with Japanese films, drama, anime and manga, which may have influenced my decision to do my Masters in this country. I also pointed out that Japanese films had long made their mark on the international stage with the works of Ozu and Kurosawa, so I thought there would be a lot for me to learn here. I think I also made some mention about how, after learning from the West (Australia), I needed a balance from the East as well. Then I spoke out some themes that KINGYO was about, love, loss, longing, regret, urban isolation etc. I then had to explain why I wanted to use split screens for the film. Easily the most remarkable feature of the film is its use of split-screen. I have long been of the opinion that such methods as multi-frame composition signify the next logical step in furthering the creative potential of the cinematic medium, with Canadian director Bruce McDonald’s "The Tracey Fragments" serving as a winning example of such experimentation in narrative film form. While that film often uses several images on the screen (arranged and edited in often complex patterns), Yeo keeps it to a maximum of only two at once for "Kingyo", but even then, the benefits of this stylistic choice are clearly seen. Its effectiveness simply comes from the way various shots play off of each other when juxtaposed on the same screen, communicating both their own meanings and different ones altogether when considered in relation to one another. Because of this element, composition and editing take on a new importance and yield more creative rewards for both the filmmaker and the viewer, and surely enough, Yeo’s careful control over the split-screen technique in his film creates a fascinating dynamic that, with the right cuts and selection of images, speaks volumes through purely visual means. 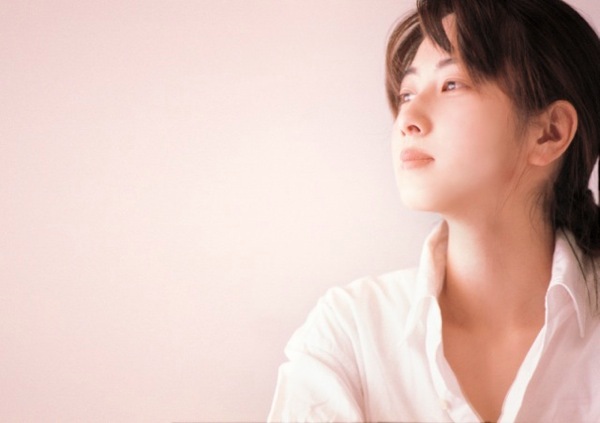 After that when asked about my future, I said that ideally, I would like to make films in both countries, Malaysia and Japan.